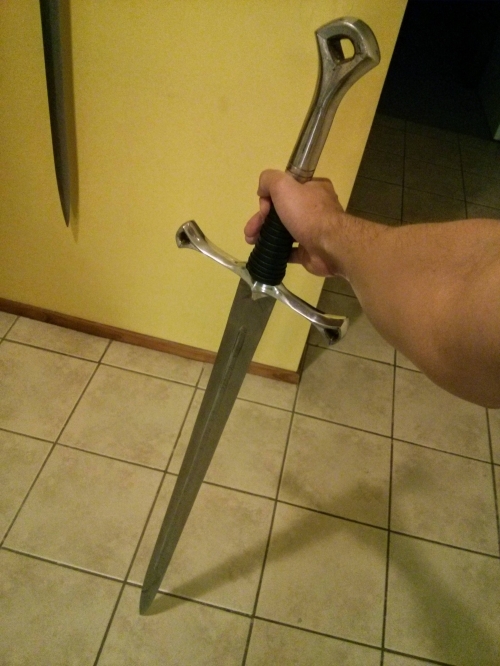 I recently bought a longsword, and I have some serious doubts about its quality and characteristics. I would like to hear your opinion, as you know a lot more than me about this. I know that evaluating a sword without being able to handle it in real life is not that simple, but I'll try my best to describe the issues. And don't be afraid of being too critic about it. It's the best I was able to afford (with very few options here), and I love it, it's my longsword. But I still want to know the honest truth about it, I don't want to lie to myself, or even risk injuries. Overall, it seems to be good. The finish is not that "clean", but it looks sturdy, I like the style, the length is correct (1.2m), and the weight too (1.8kg, 3.9 pounds), maybe just a little heavy. 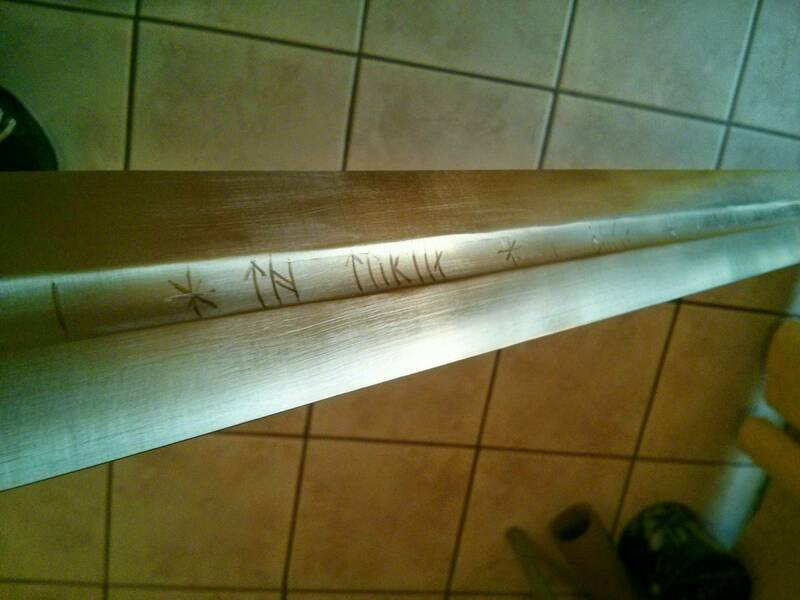 The blade seems to be of at least proper high carbon steel, as stated by the maker. Springy and not too soft. But I wouldn't know how to differentiate good steel from bad steel. Any tips on that? They are made from aluminum. Is that ok? I think not, but I don't know "how bad" it is. Could it handle hits? (sparring) Has some other bad side effects? As you cam see in the picture, it seems to be a little bit short. 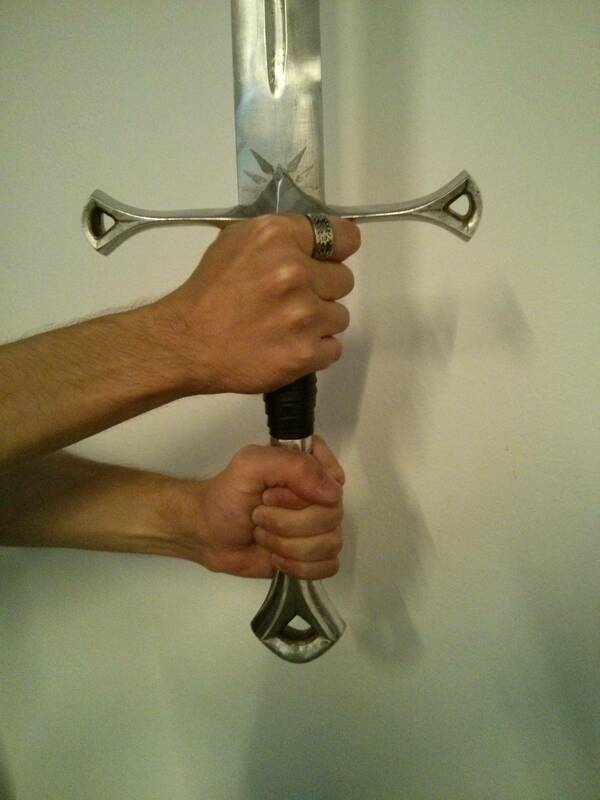 I read somewhere that I should be able to fit 3 hands comfortably, but it fits only 2 in my sword. Is that ok? If not, what other problems can I have, besides poor leverage power? It feels heavy, even when the overall sword weight is ok for a longsword. Is it in the historical ranges? How bad is it? What kind of problems can I have, besides being too tired? Does it make the sword improper or not good for fiore dei liberi techniques? The maker says it has a full tang. 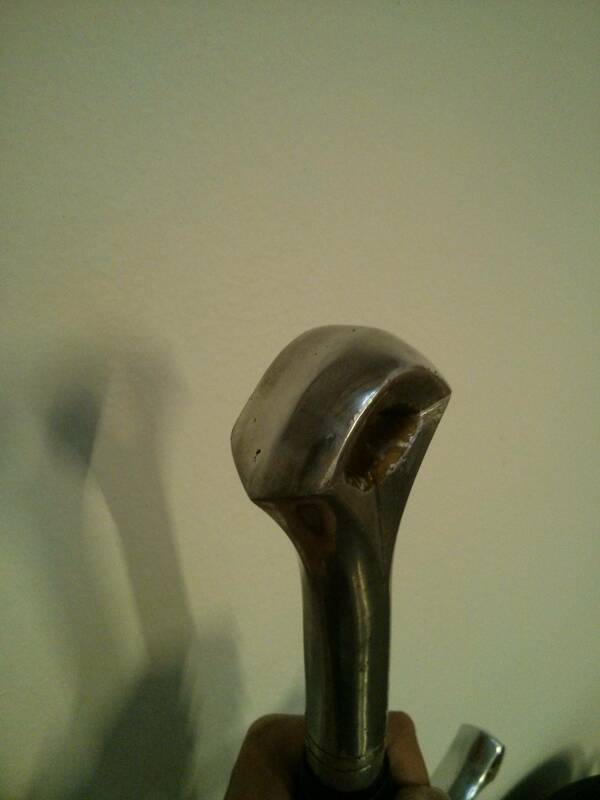 But I'm not able to tell where does it end, how deep it goes in the aluminum handle-pommel section. If it stopped at the start of the aluminum piece, how bad would that be? As you can see, it has some soft but noticeable "edges" on each side, with "spike-ish" bits at their end. 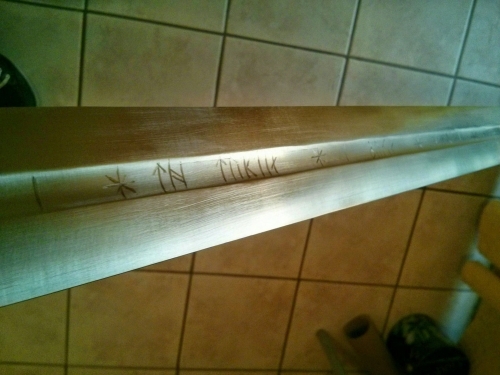 I have seen irregular pommels on historical swords, but is it "too irregular"? 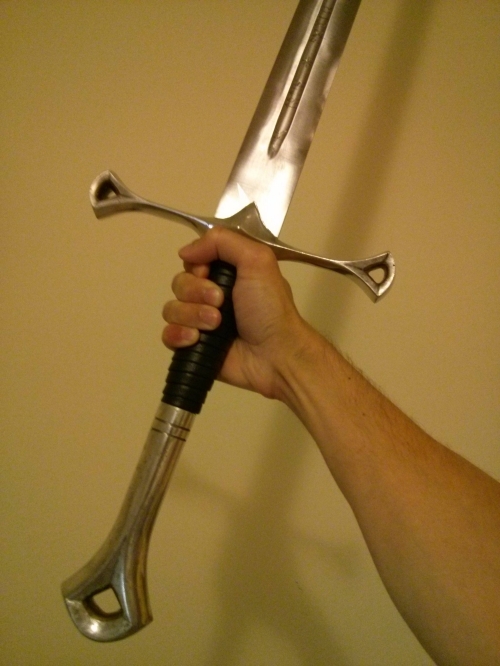 I think I wouldn't be able to handle the sword with my left hand in the pommel, without feeling pain when doing leverage. Combine this with the fact that I can only fit 2 hands in the handle, and it seems that my hands will be quite restricted. Those are my concerns with the sword. Thanks in advance for your opinions and answers! The worst part is the hilt construction. Aluminium is too light so the balance of the sword is bad. Aluminium pommel is probably screwed on the tang and that combined with the material is just not safe. The sword is heavy, badly balanced and probably badly constructed so it could probably break at the pommel and fly away even during a simple solo drill. I think the most important things are that it is your first sword, you love it, it's your longsword and you intend to use it for solo drills, for which I'm sure it will be good. As you describe the weight and balance, it seems you're not as happy with it as you could be, and it may not feel as lively in your hand as your next sword will. What's the situation importing swords to your country? *edit - just checked, no knives or deadly weapons. A lot of very knowledgeable and experienced people will doubtless chip in, but I would say never to use this for sparring (the crossbar will not be up to it). The grip is also too long for Fiore, and too thick generally; the POB might be too far out (10cm might be better), and the weight a bit too heavy for actual sparring. Doubtless a good tool to start on footwork and guards, as well building up stamina and strength ? I won't use it for sparring then, but will continue using it for solo drills. swordflasher: yes, it's quite difficult to import things in general to Argentina, there are arbitrary restrictions, +50% of the value in customs taxes, and the prices are too high because of the lack of value of our currency. Can you get someone to make something for you ? A local blacksmith or knifemaker ? Yes, the one who did this sword, hehe. He was recommended by other people I knew, that's why I bough the sword from him. There must be others, but not too many and probably not as experienced in this as european ones, because we don't have much of medieval culture/history in Argentina. I can't buy another sword for now, but in the future I'll try to find alternatives. Impressive that you choose to take the hard tripp of teaching youreself from books. Best of luck with it, others havegone before, but this is your jurney and I wish you the best of luck. Is the pommel permanently fixated? could it be changed for something heawier and perhaps scent stopper shaped? or perhapps a wheel? then the lenght of the handle could be considdered more propper - and if the pommel was made out of steel, some of the ballance point could be brought back a bit. I have sadly not held enough old swords to know exactly what Point of ballance should be used, altough I perssonally like it to be around 8-10cm from the cross. Tinkering with your sword, is a bit on the cool side for mee. Some change gripps or pommels. or even crossguards if it's a takedown. Just see what your pleasure leads you to. And the best of wishes to you. Is that a custom job, or off the peg ? Anyway, customization of this might be a good way to evolve this sword, i.e. keeping the blade, putting a steel pommel and crossguard. Or, for the next one, actually designing the sword (I think enough help would be forthcoming here). Thanks for the whishes! There are no hema clubs in my city, and the nearest one is 400km away. I'll try to attend events in other cities, but for my weekly training, I have no other option. Once I feel confident with some basics (stance, basic cuts, etc), I might try to form a study/practice group with other interested people, so at least we can share experiences and knowledge, learn together, and I can save them some time by telling them what I already know. Regarding the pommel, I think it is screwed *and* glued. The guard has also glue. So it could be difficult to disassemble it. It's something in between. The maker does not make them until you ask for one, and so you can ask for some customizations. But he gives you very little choice, he prefers to build what he already knows how to build. I asked for a different pommel shape, and he wasn't happy with it, so he ended up doing the one he knew. Ouch. Interesting phenomenon, this-- other cases documented on the forum, of the customer coming up with requests, and the maker sticking to what he likes best. As a software developer, I can partially understand him. It's hard for a "maker" to avoid feeling that you know better, instead of listening to the actual user. You probably know more about swords than he does ! I wonder if the markup on customs would apply to gifts from friends abroad? They don't distinguish gifts from bought items. If the item doesn't have a recipe, then they decide what the price should be and calculate taxes based on that (and you can't argue the price they come up with). And I took some time to read about the regulations for "white weapons" (that's how we call cutting weapons in Arg.). It seems that there shouldn't be any special treatment in customs, only firearms and firearms accessories require special permits. I'll probably see a guns shop owner later today, I could ask him if I'm right, he should know more. And gosh, those regulations are such a mess, nobody can tell you something specific and reliable about them. Confirmed by the guns shop guy: no special limitations or permits to import sword like things, just the regular customs laws. Ah, a shame gifts are not exempt from duty. Probably because otherwise people would just ask the sellers not to include the recipes, so they could say it was a gift. Some websites even have that as an option (like dealextreme.com). Still, paying taxes over a gift would be cheaper than paying taxes and paying for the item itself, hehe. So I'm gonna go and do some assumptions. Second, I assume you guys have sport fencing in argentina. Likewise, I assume that you have a Leon Paul representative somewhere. And lastly, I assume that companies don't have the 50% import tax you mentioned. So, my suggestion: get into contact with the Leon Paul guys, see if they can get you the Regenyei feder - I know they sold them for a while. Next best thing, or perhaps better, buy a big bag (140cm+), go to an event, buy stuff there, pack it in your bag and that should be it. Use it a lot at the event so that it does look used.